Traditional airlines always blame others for their delays. They claim that private jets are taking more and more air space and that antiquated traffic-control systems cannot keep up. In one sentence: the system is clogged. The truth is that big carriers themselves are creating the problem by slotting too many flights at certain times of the day and at certain airports, on purpose. Drawing on a paper by Christopher Mayer and Todd Sinai and a Slate column by Austan Goolsbee, here is the real story. Transportation congestion happens when too many agents, acting independently, use infrastructure at the same time. At a deeper level, what causes the clot is each individual’s failure to take into account that she is reducing the space available to everyone else. If the trouble with air travel were congestion, airports dominated by a single airline would never be clogged. A monopolistic company would recognize that it is only possible to operate a certain number of flights per hour, depending on the size of the airport. In consequence, it would spread out flights over the day, and we would not experience delays (other than those caused by weather or technical breakdowns). But the facts do not support this hypothesis. In fact, the data show that there is no relationship between punctuality and how concentrated airport operations are (see chart). As an example: Logan, in Boston, where the top two carriers represent only 32 percent of all flights, is about as tardy as Dallas-Fort Worth, where the dominant airline’s share is 92 percent. For the 40 largest American airports presented in the graph, the correlation coefficient is 0.09 (in a scale from 0 to 1). The real culprit of a large number of delays is the hub-and-spoke model of flight operations, which is used by the six largest American carriers (American Airlines, United, Delta, Continental, Northwestern and US Airways). In order to fly a customer from A to B, they make her go from A to their hub, and then from the hub to B. One or two hubs concentrate most of their take-offs and landings. Moreover, because they want to make layovers as short as possible, they schedule lots of landings and take-offs during a narrow time window. Just like in the case of congestion, there are more flights scheduled than the airport can handle. The difference is that airlines cluster all those flights on purpose. That this is the root of the problem is exemplified by SouthWest Airlines. In the chart, the light blue markers correspond to airports where that carrier operates more than 50 percent of total take-offs and landings. The red dots correspond to the hubs of the “Big Six.” At those, flights were on time 65.6 percent of the time on average, as opposed to 76.7 percent at airports dominated by SouthWest. The difference stems from the fact that SouthWest runs a “net” of point-to-point routes, instead of a “wheel” of hub-to-spoke flights. Because most Southwest passengers do not connect to other flights with the same company, the carrier can spread out operations over the day. To be fair to public opinion, congestion is part of the problem too. 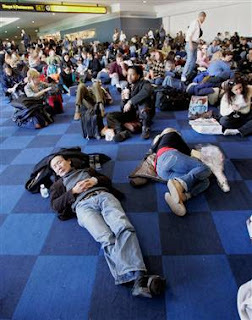 All airports, not only hubs, experience delays and cancellations. New companies have sprung up, and flights by private jets are on the rise. But a large percentage of all routes depart or arrive at hubs. Moreover, gluts created in the hubs ripple through the entire system. There are two textbook solutions to a congestion problem. The first one is to give control of each airport to a single company. That would be far too interventionist, and consumers would be hurt in other ways. The other solution is to fully liberalize the market for take-off and landing rights. If prices fluctuated freely, they would reflect the higher demand for airport space at popular take-off and landing times. Carriers would reallocate their operations and the distribution of flights over the day would be efficient. But many airports are effectively monopolized by one or two airlines. There is no congestion externality there. Liberalizing the market for landing rights in those airports would have two possible effects, none of which is desirable. First, companies could stick to their model and pass on the increase in costs to customers. Alternatively, companies would spread out their flights over the day and across airports, throwing out the baby with the bath water. But in a world of point-to-point air trips would take longer hours, longer layovers and more connections. Airports would love it. But I am not sure that travelers are willing to give up the convenience of the mainstream system. The likely truth is that delays are a built-in consequence of hub-and-spoke operations, and they will not go away as long as companies stick to the model. If you have a flexible schedule, the best options are: (a)stay away from traditional carriers, or (b)make sure not to schedule flights during a peak connection time in a hub. Otherwise, check out the historical performance of your flight on flightstats.com, and adjust your expectations. Do you avoid hub carriers? Would you choose a flight with a long layover and no delays over one with a short layover and possible tardiness or cancellation? What is the longest delay you would be willing to accept? Does it depend on whether you're traveling for business or pleasure? Please send your comments. The posting on flight delays is interesting. One thing I did not understand though. The carriers want to minimize lay over and if there are long delays at the hubs, then the carriers are essentially failing to do so, right? Then why aren't they internalizing that? Anyway, it was an interesting read. 1) Companies know that they would lose business if they included expected layovers in the scheduled travel time. Travelers want lots of connections and short layovers. (I know it's sort of irrational that travelers continue believing the airlines, but I think that that's how it is for the moment.) Creating some delays is still optimal for them (in the sense of maximizing their profits). 2) Hub airlines are affected by congestion too. They ignore the schedules of other companies. Congestion causes a bigger problem from them because they try to squeeze so many flights in a short time frame. So, in a sense, the "hub-and-spoke" model worsens the consequences of congestion. 3) I doubt that the actual layovers, after including delays, would be shorter if they ran a "point-to-point" network instead of a "hub-and-spoke network". If you want to minimize expected layover, the "hub-and-spoke" model is superior, for the moment. If air traffic increases, especially from an increase in the number of companies, delays will get worse, and a "point-to-point" network might become speedier than a "hub-and-spoke" one. Very interesting post, and the results are somewhat counter to my expectations. 2) Nearby airports-- are some dominant hubs located very near alternate airports whose congestion could spillover and interfere in the airspace of the first airport, so externalities still exist? However, I agree that very busy, cold weather affected, near busy airspace but not dominated Logan and weather unaffected, not near large other airports, one carrier dominated DFW seem to suggest that these confounding factors are not large. Basically, the problem is indeed too many small commuter jets, so that airlines provide many flights per day to medium and small sized location from hubs. However, that also provides a large benefit in the form of shorter layovers for travelers from those areas. The airlines do have a point that concentrating only on delays would impose a social cost on travelers by increasing layover time. Traveling across the continent from one medium or small city to another might be scheduled for two days or more instead of fit into one.